Can you spot the signs of stroke? As family and some friends will know, The Stroke Association is a charity close to my heart. In 1997, my granddad suffered a stroke and it changed all of our lives. Thankfully he survived but the effects have stayed with him since. In the past I’ve done events to raise money for The Stroke Association, but today, I want to raise a bit of awareness and help out TSA’s FAST Forward campaign. It happens when the blood supply to part of your brain is cut off. It can be caused by a blockage in one of the blood vessels leading to the brain or a bleed in the brain. Blood carries essential nutrients and oxygen to your brain. Without blood your brain cells can be damaged or destroyed. 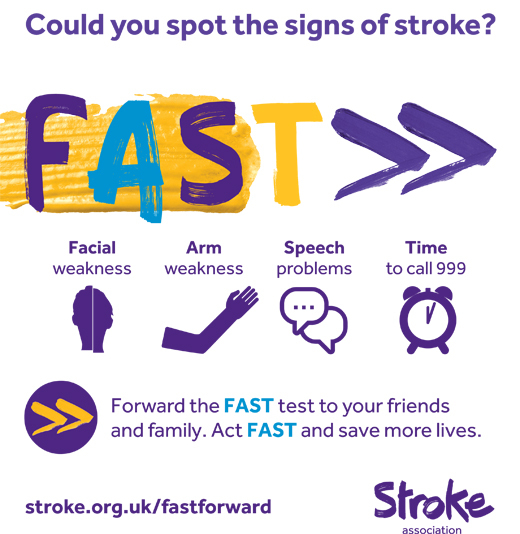 Just remember, FAST: Being able to identify someone’s ‘funny turn’ as a stroke may not only save their life but help aid them in recovering quicker. Getting a stroke victim the proper medical attention they need as fast as possible is absolutely crucial. For more information on mini-strokes, be sure to check out TSA’s fact sheet here. If you’re interested in learning more about strokes or how you can help, check out The Stroke Association online. Their website offers valuable, life-saving information as well as support for those who have had a stroke as well as for carers and family members. For those of you based in the US, you’ll want to check out the American Stroke Association.